On February 21, we had a reunion with Ms. Mélanie Moreau, curator. 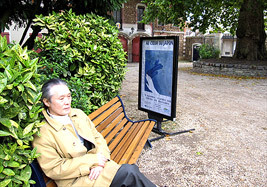 She invited us to the Château des Bouillants, an art museum in Dammarie-lès-lys, suburb of Paris in 2008, and helped us with an exhibition which was the first time for a Japanese. This time, she came to Japan to supervise "Théodore Chassériau : Parfum exotique" exhibition. Théodore Chassériau is a romantic artist of the 19th century who is highly esteemed in France, but is not very well known in Japan. 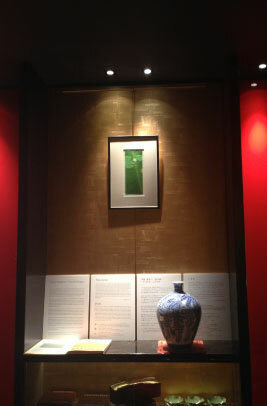 The exhibition will be held up to May 28 at the National Museum of Western Art. Please don't miss it! On February 21, I reunited with Ms. Melanie Morrow of curator. * Click a photo to see an enlarged display. Last year, a ceremony was organized to celebrate the 55th anniversary of the sister-city affiliation between Kobe and Marseille which is in the middle of a Japan boom. 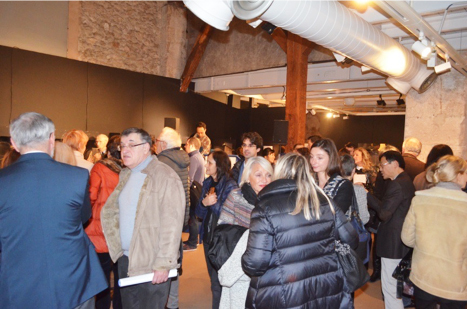 An art exhibition is being held under the co-organization by Marseille City and the Consulate General of Japan in Marseille. The exhibition gathers much attention with exhibits such as "Kyo yaki" ceramics and "Hangiga" woodblock prints both of which represent Japan. It is held from February 16 to March 25. The venue of the exhibition has superb space. Our first exhibition in Ukraine was held at the Hanenko Museum in Kiev and was supported by the Japan Foundation and the Japanese Embassy. The opening ceremony on the first day was a great success with many guests and the media (3 TV stations and 10 newspapers). 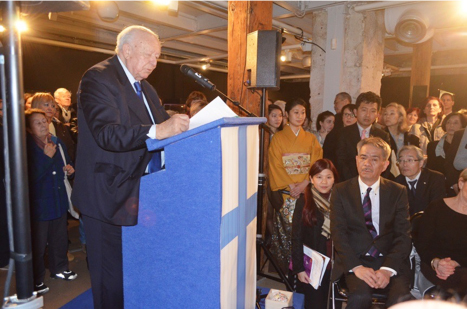 We would like to express our heartfelt thanks to Ms. Vira, Director of the Hanenko Museum, Ms. Svitlana of the Ukraine-Japan Center, Mr. Furukawa, Mr. Miyazaki, Ambassador Sumi, Ms. Shiori Saito and Francois, people in Ukraine who came all the way to the museum and many more people who made efforts to realize the exhibition overcoming numerous difficulties. The exhibition was spotlighted on TV and the following link shows a news program of one of the TV stations which covered it. The atmosphere of the venue is well-presented. Watch the moment when "hangiga" has become a global language. It is our 13th year in Hirosaki. It is the 3rd time at Tanakaya Gallery. 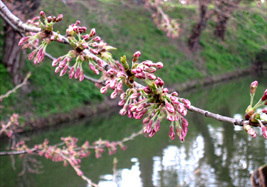 This year, the exhibition was 10 days before the Sakura Matsuri festival, but surprisingly cherry blossoms started to bloom! They did not reach full bloom, but made the exhibition a heartfelt atmosphere. Our annual visitors, Mr. and Mrs. Miura from Miura Shuzo which is famous as the brewer of a Japanese sake named "Houhai" came with their grandchild after a long interval. She is only 8 years old, but already seems to be a person of sensibility which made her say "I like this one!" 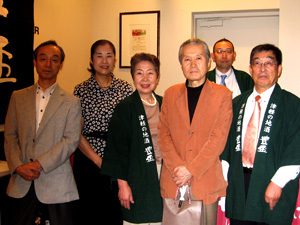 Mr. Nakamura of the association for firefighting and his family have continuously been giving us support for 13 years. His daughters were elementary students when we met them first. The elder daughter is now a university student and the younger daughter will graduate from high school next year. We felt the years of history of our regular visitors at the exhibition in Hirosaki. 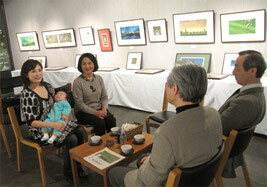 This year's exhibition in Seigetsudo Gallery received a special prize from the salon. We are truly grateful to you all who have been supporting us for long periods. Many people came all the way to celebrate. We also met new people. Some people visited us with all their family members as always, and some people came with their children. When we first met them, they were in their mothers' womb, several months' old babies or elementary students. We were amazed to know how fast time flies! 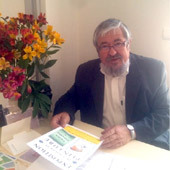 Thank you very much for your coming to the exhibition during your busy schedule. There is only one street with the name of a Japanese artist in France, and it is located in Grez sur Loing, which is famous as a village of artists. The name of the street is "Rue Seiki Kuroda". During the 1920's, many Japanese artists whose base of creative activities was in Paris, including Seiki Kuroda, Torajiro Kojima, Tsuguji Fujita and Tadashi Arai, gathered in the village. 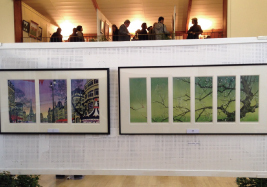 During the "Arts en val de loing - Peinture Japonais à Grez sur Loing" exhibition which was organized in the village with a long and distinguished history, the woodblock prints created by Tsuzen Nakajima were awarded a superb award, the Mayor of Grez sur Loing Award. We think that the award was given for his works as well as for the dedicated support by Ms. Shiori Saito who has been working as a coordinator in Paris with deep love in Nakajima's works. On this occasion, we would like to express our sincere gratitude to her. Atmosphere at the venue At "Salle Fernande Sadler"
A high-class Japanese-style restaurant "Hanawa" strikingly stands out in Champs-Elysees in Paris. 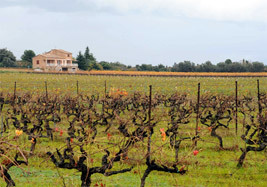 It is famous as a well-established Japanese restaurant visited by many remarkable celebrities in France. 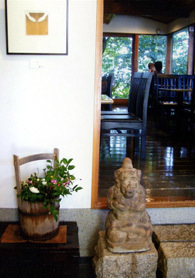 At the gallery in the restaurant, Tsuzen Nakajima's 20 hangiga works were exhibited for a month. 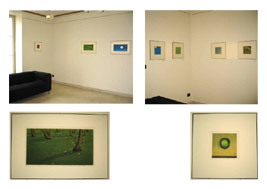 The gallery is a special place where only distinguished artists with recognition in France can organize exhibitions. We have had many visitors again which led to a pleasant atmosphere. 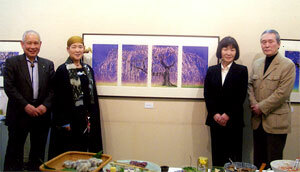 Ms. Ohara came all the way from Sendai City, Miyagi Prefecture to the exhibition. We recognized how her experiences have been hard by listening to her actual experiences about the Tohoku Earthquake. We thank all the visitors for their coming. We are truly happy about meeting with new people as well as reuniting with our old friends. Atmosphere at the venue. So crowded! The new collection of works has been so favorably accepted. Mr. Nakajima did not visit France during this exhibition. For the first exhibition since he became a member of the salon after being awarded the Silver Prize, he exhibited a new work "Dai-hanabi (big fireworks)". It is a woodblock print; however, it was exhibited in the painting section and not the woodblock print section. His hangiga was the only multi-color print, which surprised all the visitors. With cooperation by two French interpreters, we were able to introduce what hangiga is to many people. Saint-Maur is around a 30-minute drive from Paris. 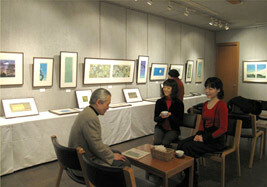 A big block print exhibition is held there every two years. 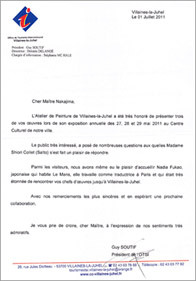 Mr. Nakajima exhibited his work as a guest artist and the honorable Mayor of Saint-Maur's award was given to him which is a first for a Japanese artist. In addition, a concert by three Japanese musicians (Japanese drum, tsuzumi and clarinet) was held. We heard that the collaboration of hangiga, musical performance and Japanese dance was so beautiful and visional. We are truly grateful to Ms. Brigitte Perol who organized the exhibition and Ms. Shiori Saito who provided us with her sincere support. We organized an exhibition to commemorate the release of a new collection of works at a sunlit gallery with a superb view located on the Ginza Corridor Street. 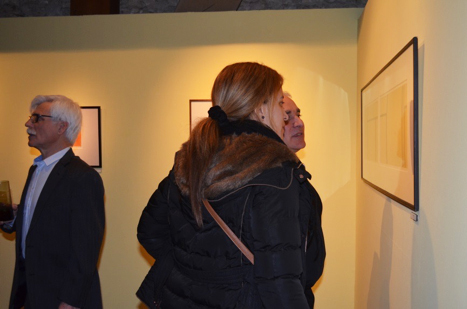 The exhibition was focused on the 12 works exhibited at the exhibition organized by the Société Nationale des Beaux Arts last year. All the visitors were able to look at these works in a comfortable atmosphere in the spacious galley and the new collection was so favorably accepted. A tourist from Europe who happened to visit the gallery was glad to see the English and French captions and bought the collection of works as a souvenir. It takes about 1.5 hours from Paris by car. Through the forest of Fontainbleau from Paris, the exhibition was held in Souppes-sur-Loing town. The venue was a monastery built in 1181. It was a really beautiful place. Since the theme was the homage to Mr. Kiyoshi Hasegawa, a copperplate engraving artist, many block prints were exhibited including valuable ukiyoe. Tsuzen Nakajima was invited as the only participant from Japan. The entrance of the venue, monastery. This year again, we were in Hirosaki during this season. When we arrived, the cherry blossoms were still in bud, so we thought we would be lucky if we could see a few cherry blossoms. However, at our last day in Hirosaki, the cherry blossoms started to bloom to their full bloom only in 6 hours which was amazingly beautiful! Hirosaki is a castle town, but it also has a lot of Western-style buildings. It is also famous that there are many French restaurants. The Hiroshima family came all the way to Hirosaki from Tokyo to see the exhibition. We heard that they fully enjoyed their stay in Hirosaki. We are looking forward to seeing you in Hirosaki next year! This is the old headquarters of the Aomori Bank. 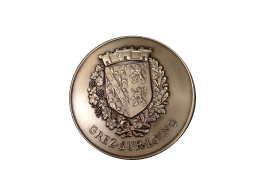 Thanks to the Silver Prize given by the Societe Nationale des Beaux Arts, we have had so many visitors. Especially, many alumni of Kumagaya High School who have been maintaining a good relationship after graduation came to see "Aka-iraka". We are truly grateful to them all for coming to the gallery during their busy schedules. 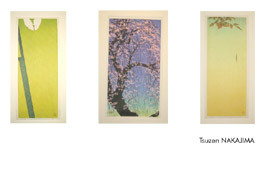 Tsuzen Nakajima was invited as a noteworthy artist by Société Nationale des Beau Arts, which has a 150-year history and is the only salon supported by the President of France. The venue was Carrousel du Louvre where 700 artists including participants under public participation gathered from all over the world. 12 pieces of his hangiga were displayed on a wall of over 12 meters. He was the first woodblock print artist in its 150-year history which attracted attention. In addition, he was given a Silver Prize from the salon with a long and distinguished history. Awarding a Silver Prize to woodblock prints was said to be a feat because the salon has been focused on oil paintings; his hangiga received an exceptionally high evaluation about all the aspects including techniques of carving, composition and printing. Many people supported us which led to this award. 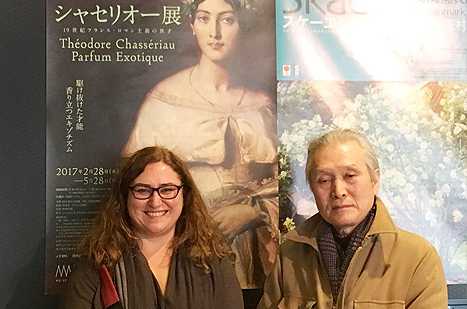 We are deeply grateful to Mr. Kojiro Akagi, Vice President of the Société Nationale des Beaux Arts, François and his wife, Shiori who accepted all the troubles as coordinators, Ms. Koga from Espace Japon and especially all the visitors who came all the way from Japan to Paris. In front of Ms. Séverac's work. This was Tsuzen's first one-man exhibition at this gallery under our friend's introduction. Many visitors came to this light-filled gallery located along Omotesando with a casual atmosphere which is different from galleries in Ginza. 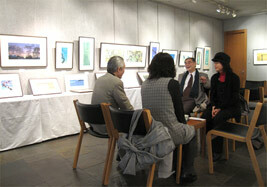 Mr. Amamiya, owner of the gallery, provided us with good support which led to a pleasant week. We are truly grateful to him also for his introducing Nakajima's works to the people in various fields. 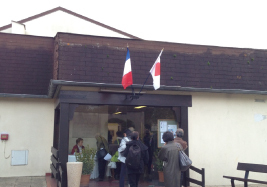 This exhibition was held at the birthplace of Francois, husband of Ms. Shiori Saito. The exhibition project was designed by his father. We owe the family of Ms. Saito so much which cannot be expressed in words. On this occasion, we would like to express our sincere gratitude to them. The works of Tsuzen Nakajima created a great sensation among visitors of the exhibition in Loire which resulted in large coverage in the article about the exhibition. 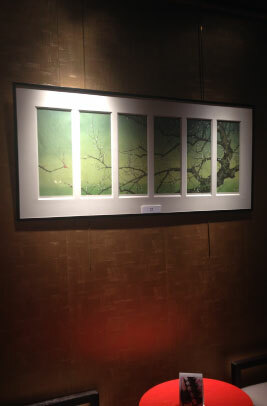 The works by Mr. Tsuzen Nakajima, who is one of the great Japanese artists, were exhibited. He is already famous as an international artist and will participate in an exhibition scheduled at the Louvre Museum in a few months. We received a letter of appreciation by the President of the Tourist Bureau. 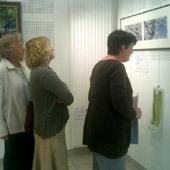 You participated in the exhibition held in Villaines-la-Juhel for three days from May 27 - 29 with three works. We received a lot of inquiries from visitors which were dealt with by Ms. Shiori Saito. One of the visitors, Ms. Nadia Fukao, a Japanese translator living in Mans and who works in Paris told us that she was so surprised and impressed to find that she was able to see works by such a great artist in Villaines-la-Juhel. With my deepest respect and gratitude, and wishing for our long-lasting relationship. The lady in the left is Ms. Shiori Saito. She really is a wonderful lady! 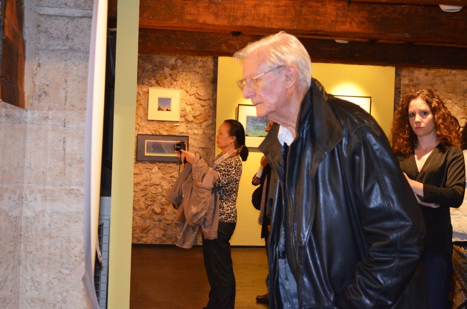 All the visitors were so ardently looking at his works. We will have a one-man exhibition in autumn in Omotesando Hills after several years' interval. Our encounter with Mr. Amamiya, the owner of Gallery 80, seems to be by fate. The relationship was made through our friend, Tawatari-san. The first appointment we made with him was on March 11. The confusion on the day is still fresh in our memories. We are really glad that we can organize this one-man exhibition in September. We are going to show 40 works including the ones to be exhibited in the Louvre Museum with an attractive display. Please wait for it with anticipation! We had many guests this year, too. As the name indicated, the exhibition of new artworks was full of new ones. Each of them was unique in terms of interesting compositions, peculiar printing techniques using many colors or delicate lines. Actually, passion for creation will never decline. 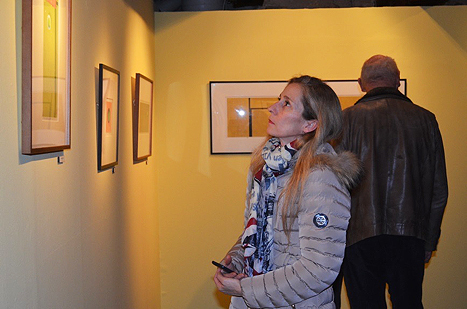 We are happy that all of visitors really seemed to enjoy the exhibition. A one-man exhibition after the terrible disaster. The impact on the Tohoku region is the suffering for all of us in Japan. 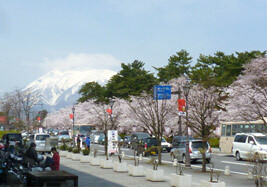 In such a situation, cherry blossoms in Hirosaki were so cheerfully beautiful. The unusually late blossoming does not seem to be just a coincidence. We were keenly aware of enjoyment of life by looking at cherry trees which always bloom so beautifully. Cherry blossoms in Hirosaki were so gorgeous at only around 70% of their peak. Iwaki-san mountain covered with clouds which is a rare scene. 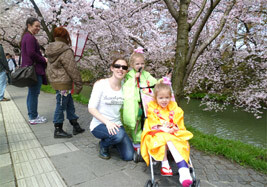 Major players of Setagaya Tamagawa Hojinkai visit Hirosaki... Little foreign visitors in kimono. So cute! 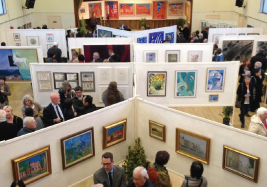 This time, exhibitions were held at three locations from September to November. For Espas Japon by OVNI, a superb exhibition was realized thanks to sincere efforts by Ms. Shiori Saito who produced the entire project and Ms. Ritsuko Koga of Espas Japon. Many guests participated in the opening party and we received offers from the Netherlands and Germany. This was Tsuzen Nakajima's second exhibition in Dammarie-lès-lys. It was unusual because its concept is not to organize more than one exhibition for the same artist. 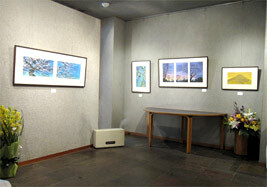 Therefore, this was a group exhibition under the theme, wood block prints of the world. However, its poster which entirely consisted of "Nishiki" by Tsuzen Nakajima conveyed the passions of Ms. Moreau who was in charge. 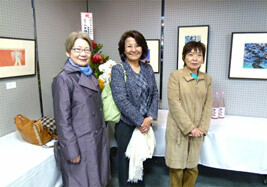 In Laudun City in November, he participated in an art exhibition under the theme "Japan". 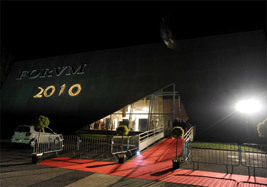 The exhibition had more than 3000 visitors each and every day. 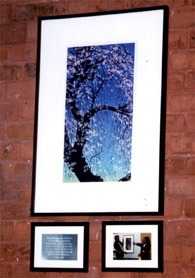 There was a competition but his works were exhibited as works of a guest artist. He seems to get many fans! and Dr. Sasaki, a private practice dentist. June 20. Mr. Miura of Miura Shuzo, a brewer of Japanese sake, who has always visited and supported exhibitions in Hirosaki, organized a tasting event at a wine specialty shop "Party" in Ebisu, Tokyo. More and more people are getting fascinated by superb sake brewed in Hirosaki. 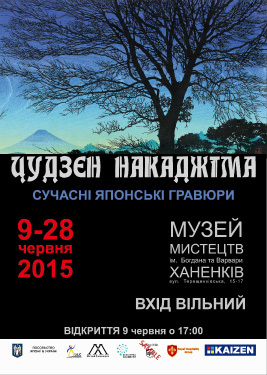 This as the seventh exhibition in Hirosaki. We have had many visitors every year which always makes us look forward to visiting there once a year. 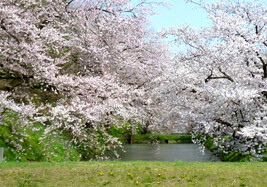 This year, cherry trees were late in blooming and they were at their full bloom during the Golden Week. Cherry trees with abundant tightly closed buds have a different taste. This year, we had a one-man exhibition for the first time at "Wanicome", a local center established by Owani Town which is located in a suburban area of Hirosaki. 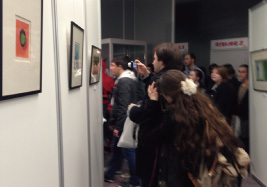 We heard that the exhibition had more than 1000 visitors a day. This is all thanks to Mr. Yasunori Soma who has been extending his support for years and efforts by all related persons. We are truly grateful to them all. 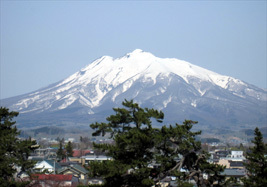 Iwaki-san mountain which is also called "Tsugaru Fuji". The cherry trees in Hirosaki have very gorgeous bunches. We heard the nice and stable sound of Tsugaru-jamisen. This one was the sixth one-man exhibition at Seigetsudo Gallery in Ginza. Many of Mr. Nakajima's new works created this year were in a large size; many visitors shouted in exclamation by looking at a new work with an unexpected taste named "Kome (rice)" whose motif was literally rice. 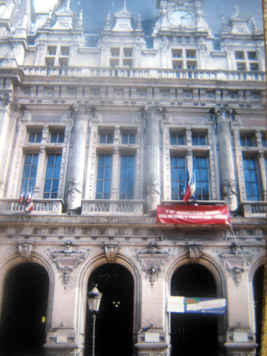 Three one-man exhibitions are being planned in France this year. We are sure that this one will give a strong impression to all visitors. 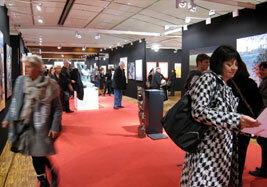 We would like to thank all the people who came to the exhibition during their busy schedule. New work "Fuji Hakuhou (Snowy Mr. Fuji)"
Ryo with his mother Kyoko and grandma Emi. Kidou with his mother Aiko and his papa. Yuta with his mother Akiko. 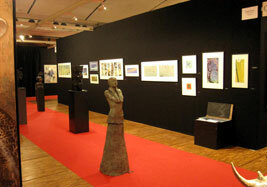 This exhibition was a long one which lasted from November 14 to December 24. We would truly appreciate kind hospitality just like we had in March 2008. We also had new visitors who always give us fresh impressions. We will do our best so we can make a favorable report when we will see you again with a hope to see you all soon! With Ms. Hitomi Hirao of "Tenfuku Hirakoshi"
■Hangiga has been donated to the University of London to commemorate completion of its new auditorium. To commemorate the completion, the Tomonkai, the alumni association of Waseda University, donated Tsuzen Nakajima's hangiga, "Shidarezakura". 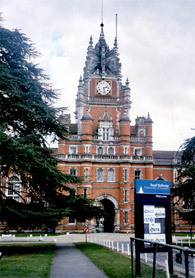 Royal Holloway, University of London Donated hangiga "Shidarezakura"
The invitation to have a one-man exhibition in Dammarie-lès-lys was the first one for a Japanese artist. It is a beautiful town which is adjacent to Fontainebleau. There were numerous posters on the exhibition in the city which was so impressive and inspiring. There were many visitors everyday and we had a gross audience exceeding 1000 persons. We heard that it was a record-setting issue. Lectures on "Hangiga" were held during the period of the exhibition; it was a truly exciting exhibition which led us to feel that it was an exchange between Japan and France in the true sense. Ms. Melanie Moreau who was in charge of this exhibition exerted her utmost effort. On this occasion, we would like to express our sincere gratitude to her. 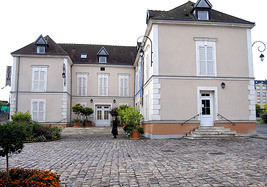 Front view of the exhibition venue, the Château des Bouillants Little break in a park. 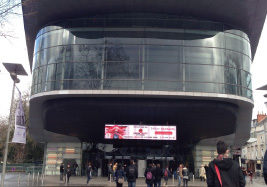 Posters of the exhibition were presented all over the city. In front of Château de Fontainebleau. 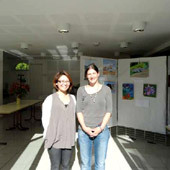 Left: Ms. Melanie Moreau who was in charge of the planning through operations of the exhibition in Dammarie-lès-lys. Right: Ms. Shiori Saito, who was in charge of the exhibition in Paris, helped us a lot including arrangement of an interpreter. With Catherine, Manager of the Cultural Department of Dammarie-lès-lys, Frank, Director of the Château, Ms. Yukiko Yoshida, interpreter and Ms. Moreau. With a teacher of an adult class. Lecture: At a classroom in an elementary school. Lecture: A class for the youth with enthusiastic students. A youth group which will soon leave school. Before independence as an adult. Sitting in a circle and having an exciting discussion. A female teacher with strong leadership. We would like to go to Japan!! Seeing off children going home. A meeting with adult citizens in the evening. Enthusiastic adult citizen. Some of them understood Japanese. 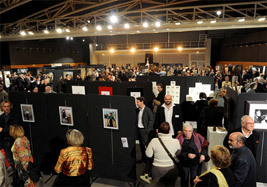 Many people assisted us for the organization of the exhibition in Paris. 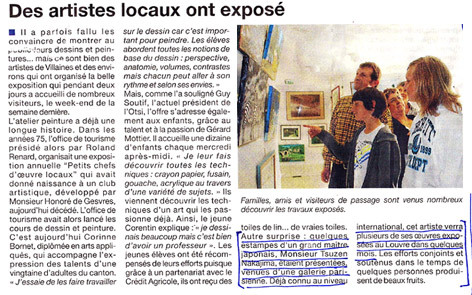 We will have another report about the exhibition in Dammrie-les-lys, a suburb of Paris. 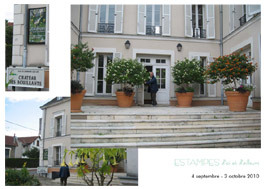 We are looking forward to seeing how the appeal of Nakajima's works will be drawn in the atmosphere of the old chateau. 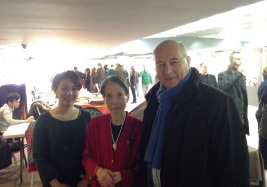 With Ms. Shiori Saito who is in charge of the Centre Culturel Franco-Japonais in Paris. She gave us every possible support. It was one of the best encounters for us. With Moe-san, a daughter of our friend who assisted us during the visit, who is studying in France. At the Place de la Concorde. After a 3-year interval, we met many old friends and many new friends. His works have been, and will be used for the covers of the monthly magazine "Voice" 2006 issues which are published by PHP and sold on the 10th. * Click a image to see an enlarged display. 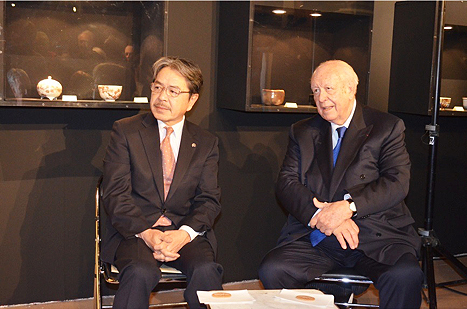 Mr. Akio Uozu of the Museum gave us considerable support for the realization of this exhibition. On this occasion, we would like to express our sincere gratitude to him. In his beautiful homepage, he introduces Mr.Nakajima's woodprint works with his deep knowledge about his art. Please visit the following URL. Tsuzen Nakajima, explaining about his "hangiga"